A winter squash is an intimating veggie. Not for its looks – winter squashes are so interesting and festive. But from a cooking perspective, home cooks may avoid them. Fortunately, produce sections of many stores have pre-cut squash for you to use. If you want to prep a winter squash, try these tips to make the process easier, and pick the way that makes sense for you. Along with the directions below, watch the video showing how to do each technique. This option is great when you do not want to use a knife for a hard, raw squash. Bake the squash whole and then cut in half. Remove seeds and cut into pieces, mash the insides, or use in recipes. Wash whole squash and pierce the skin in several different spots with a sharp knife. Place on a microwave-safe dish and microwave for 8 minutes. Microwave another 8-10 minutes depending on how large squash is. Place on an oven-safe dish and bake for 45-60 minutes. Larger squash may need 90 minutes or more. When squash is easily pierced with a knife, the squash is ready to eat. Or use a fork or knife to see how soft the inside feels. Cooking half a squash goes faster than a whole squash. Sometimes a knife does not want to easily go through a winter squash, so be careful and consider investing in sharp knives. Wash whole squash and dry with a clean cloth. Carefully, cut squash from the stem down. 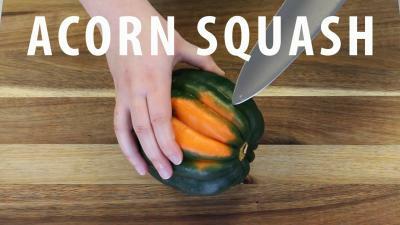 You may need a rubber mallet to help move the knife through the squash. Scoop seeds and strings out of each squash halve with a spoon or melon baller. Place cut-side down on a microwave-safe dish with an inch of water. Microwave (uncovered) 5 minutes. Microwave another 5-10 minutes or longer depending on squash size. When squash is easily pierced with a knife, the squash is ready to eat. Place cut-side down (more steamed effect) or cut-side up (more roasted effect) on an oven-safe dish and bake for 30-45 minutes. Larger squash may need 60 minutes or more. When squash is easily pierced with a knife, the squash is ready to eat. Wash whole squash and dry with a clean cloth. Carefully, cut top and bottom off squash. For thin-skinned squash, use a vegetable peeler and peel in a downward motion until all skin in removed. For thick-skinned squash, use a sharp knife to remove skin. Cut squash in half. Scoop seeds and strings out of each squash halve with a spoon or melon baller. Cut into desired sized pieces and use in recipes as directed. For a way to use the seeds, use these basic directions for roasting. These are a yummy snack. Rinse off seeds to any pulp and strings. Pat dry with a clean towel or paper towel. Mix with a bit of oil and any seasonings you want, such as salt and pepper, cumin and cinnamon, etc. Spread flat on a cookie sheet and bake around 30 minutes, stirring frequently. Seeds should be golden brown and crisp, but not burnt.